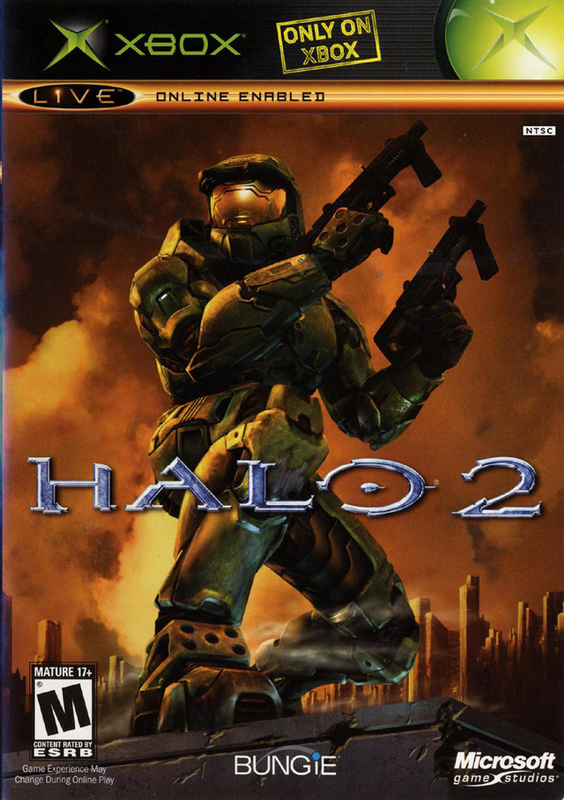 Now here’s the cover to Halo 2 and a screenshot. The in-game graphics have caught up to the box art, have surpassed the box art, even. 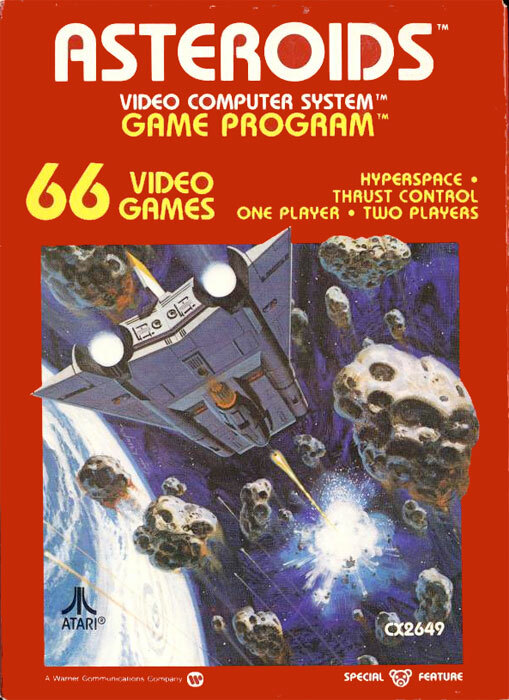 There’s no longer a need to use the imagination to fill in the gaps left by all those 8-bit games. It’s all about emulating reality now, or rather emulating the perception of a reality in which we’re protected by magic armor and moving at hyperspeed. 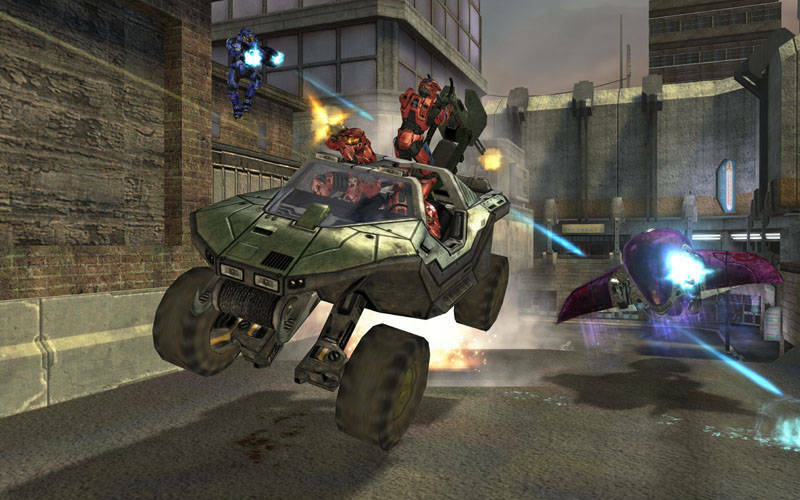 I’m not saying the old games are superior (we would have literally died of ecstasy if we’d seen and played Halo 2 in ’82, even ’90), though many of them are much more challenging as games. You can’t save your progress in Donkey Kong or Super Zaxxon. When your little men are gone, that’s it; you start from scratch. That’s why the high score meant so much. The gaming industry, now and then, is in the escape business. It does what it has to do to get us to put more coins in the escape machines. The difference is that the escape is much more pervasive today. The time I spent in the arcades or on my Atari 800 simply doesn’t compare with the hours kids and adults today spend on World of Warcraft and StarCraft. Another thing: adults didn’t used to play, at least not the way they play now. Parents would occasionally indulge, but they were usually embarrassed; they had “something more important to do.” I’m not sure that any activity post-internet is more important than keeping and staying entertained. Escapism in moderation is a good thing, but gamers tend to have a different idea of moderation than non-gamers and dabblers. Truth. If all my friends and I went ape-sh** over Dragon’s Lair in ’83, I can’t imagine what would have happened if someone handed us Halo 2 back then. I think I would have vaporized on the spot. Or maybe have that totally overwhelmed look like those ’50s prom kids had in Back To The Future when Marty went crazy on that guitar. Kids these days were born with mice in their hands; perhaps that’s why it’s almost natural for them to turn to computers for entertainment. But adults? Hmm. Hard to understand why/how the escapism is so pervasive. 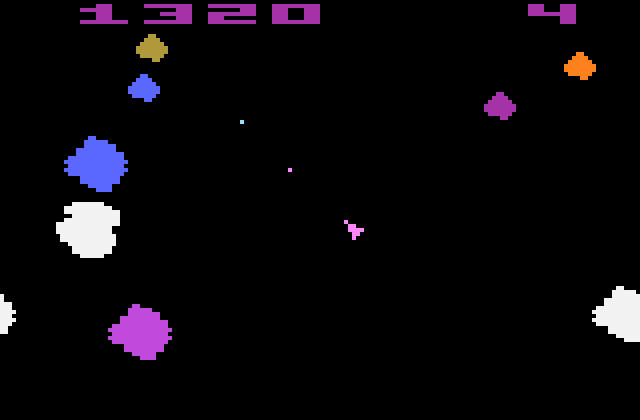 The longest I can remember playing an Atari game consecutively may have been a few hours…I know I played my pal’s Defender game (Atari 5200 version, it ruled) from about 11pm–2am during a sleepover, trying desperately to reach a personal best (while he snored away). I have friends now that have played World of Warcraft for over 10 hours straight…like total all-nighters, literally. Have game-makers succeeded in making their games that addicting, or are adults these days so desperate to escape reality? Or is it a combination of both? Part of it is that is was so damn frustrating getting so far into the game and having to start all over. There’s only so much of that you can take. Whereas now when you die you just respawn, and the game never stops. If I could keep drinking beer without getting full or throwing up, would I stop drinking beer? Agreed…starting from square one was not only hard on the morale, but hard on the allowance, lol. I remember having “bad days” where I simply could not connect with my favorite arcade game, and wouldn’t come close to beating my high score at all. It’s almost as if my “best days” were ones were I took some kind of relaxed Zen type of approach (almost like using The Force, I suppose). Perhaps that’s what arcade hot shots were made of back then – pure commitment and determination. That’s the stuff that makes movies like The King of Kong: A Fistful of Quarters (which you must see if you haven’t already). I remember wanting to meet the mysterious person who always placed first or second in the Xevious rankings at my local bowling alley. For many, the 3-letter moniker you placed on the chart was something to be proud of. Oof. Respawn. Surely the dividing word between now and then. Good point about the beer. Mmm…Beer.